Facebook. For many people it's either a reason for living or the most colossal waste of time. (Sometimes, it's both.) But if the latest research holds true, it could also be something else — a driver for obesity and poverty. These are the findings of a study conducted by Andrew Stephen, associate professor at the University of Pittsburgh, and Keith Wilcox, associate professor at Columbia University. According to the researchers, the social network does have the propensity for boosting self-esteem, but that can actually negatively influence our decisions and judgement. 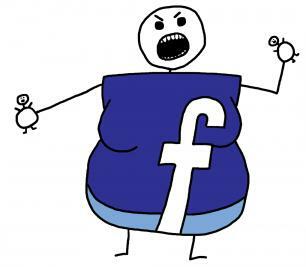 They also believe that Facebook undercuts self-control, which can lead to behaviors like overspending and overeating. Seems like kind of a stretch, no? And yet, the professors found that a link exists between Facebook usage and higher credit card debt, and that it only takes as little as five minutes of use per day to weaken a person's will power. This falls in line with a previous study correlating bad credit scores and credit card debt to lower self-control. There are many aspects of modern tech that draw attention from the scientific community, but Facebook seems to be its favorite topic these days. That's no surprise, considering the network's popularity — founder Mark Zuckerberg's runaway dorm project just hit the 1-billion-user mark early last month, and it's on track to double that by 2014. (Here in America, 71.2 percent of Internet users are on Facebook, says the company.) Facebook's ubiquity has the mental health community concerned about mounting incidences of Facebook Addiction Disorder. And so the experts plough on, studying, researching, agreeing (and disagreeing) about how deeply our social media habits are affecting us. It lifts our self-esteem. It undermines our self-esteem. It endlessly offers new settings for greater control. But it hampers our self-control. It keeps us informed. But it's making us poor. It foists numerous weight loss ads at users, all while making us fat in the long run. When it comes to the Internet's most popular social network and its impact on us, there aren't a lot of certainties. But one thing's for sure: When it comes to Facebook and addiction, self-esteem, obesity, poverty, and our general well-being, the research is still really only just beginning. According to research published by Computers in Human Behavior, the 526 million people who log on to Facebook every day experience a self-esteem boost by using their profiles to construct how others see them. However, another study by a Ph.D. student in Stanford's psychology department found that Facebook leads users to feel dejected and worthless when comparing their lives to those of their friends online.